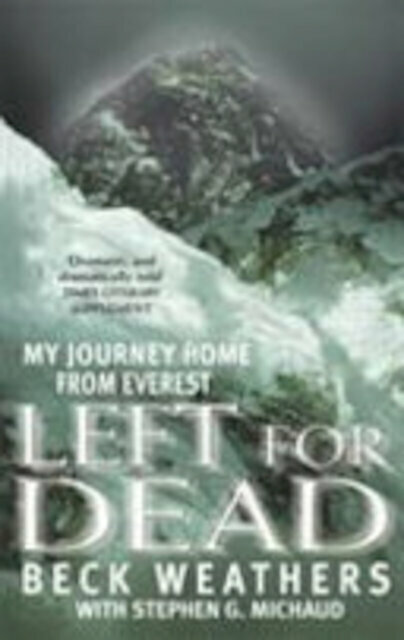 Anyone who has read Jon Krakauer's famous account of the 1996 Everest disaster, INTO THIN AIR, will remember the story of Beck Weathers: the gregarious Texan climber who went snow-blind in the Death Zone below the summit and who spent a night out in the open during a blizzard that took the lives of a dozen colleagues and friends. Even as he staggered back into Camp 4 the next morning, Beck's condition was such that the other survivors assumed he would not make it back down the mountain. He was effectively left for dead, but drawing upon reserves of determination and courage he didn't know he had - as well as the extraordinary selflessness and bravery of a Nepalese helicopter pilot he'd never met - he finally made it to safety. Only then could a new battle begin: to rebuild his life with a family he'd taken for granted for too long. Heartstoppingly exciting and ultimately very moving, LEFT FOR DEAD is a terrific read.